Sunny with gusty winds. High 46F. Winds N at 20 to 30 mph. 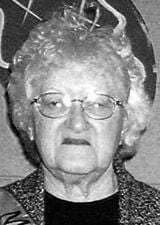 Winds could occasionally gust over 40 mph..
RACINE—Beverly E. Sorenson, 82, passed away at Lakeshore at Siena on Thursday, January 10, 2019. Beverly was born in Wisconsin Rapids on June 8, 1936 to Irvin and Esther (nee: Ehlert) Polansky. She graduated with a Journalism degree from UW-Oshkosh. Beverly was employed as a HUC at St. Catherine’s Hospital. She served on the Literacy council and spent time listening to kids read at the school. Beverly enjoyed golfing and playing cards. She was a member of the Bridge club and gardening club. Beverly also played Sheepshead on Tuesdays at Harbor Light. Beverly is survived by her husband Alan of Racine, Children Catherine (David) Smith of Australia and Mark Sorenson of Fredonia, 4 grandchildren, brother Rev. Roger (Erica) Polansky of Rochester, MN, Aunt Irma Behling and dear friend Maryann Carr. She is further survived by nieces, nephews, other relatives and friends. Beverly was preceded in death by a sister Doris (Layard) Ehlert and Sister in law Maxine (John) Stone. Cremation will take place and no formal services will be held.